The last 13 consecutive seasons LeBron James has played in the postseason, including eight straight appearances in the NBA Finals. 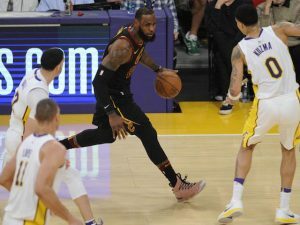 Odds makers believe he will return for a 14th straight playoff appearance this season, which is the first, he will be playing with the Los Angeles Lakers. On Sunday, odds makers opened the betting for NBA season win totals and the Lakers are pegged at 48.5 wins in a deep Western Conference. The team with the highest win totals at 62.5 is the two-time reigning champion Golden State Warriors. The Warriors total was eight higher than any other team in the Western Conference. Next is the Houston Rockets with 54.5 wins, while the Oklahoma City Thunder was third at 50.5. In the Eastern Conference the Boston Celtics have the highest win totals at 57.5 followed by the Toronto Raptors and Philadelphia 76ers with 54.5 wins each. The Lakers and six other teams in the Western Conference have win totals in the 40s. The Utah Jazz are identical to the Lakers at 48.5, while the Denver Nuggets follow at 47.5, New Orleans Pelicans at 45.5, Minnesota Timberwolves at 44.5, San Antonio Spurs at 43.5, and Portland Trail Blazers at 41.5. When James left Cleveland the first time to join Miami in 2010, the Heat won 11 games that first season. When James returned to Cleveland from Miami in 2014, the Cavaliers won 20 games more his first season back. Last season, the Lakers finished 35-47 and James’ signing with the team immediately changed all expectations. LeBron’s teams have averaged 52.2 wins in his 15 seasons in the NBA. However, the last time Los Angeles won over 45 games in one seasons was in 2010-11, with a roster that included Kobe Bryant and current Lakers head coach Luke Walton. The Rockets are expected to sign another star in Carmelo Anthony, but odds makers has said that Houston’s odds would not be impacted by signing the veteran forward. The four lowest win totals were the Atlanta Hawks with 23.5, the Sacramento Kings with 25.5, the Chicago Bulls with 27.5, and the New York Knicks with 29.5. The Cavaliers are now listed with 30.5 wins after finishing the regular season earlier this past May at 50-32 and reaching the NBA Finals.